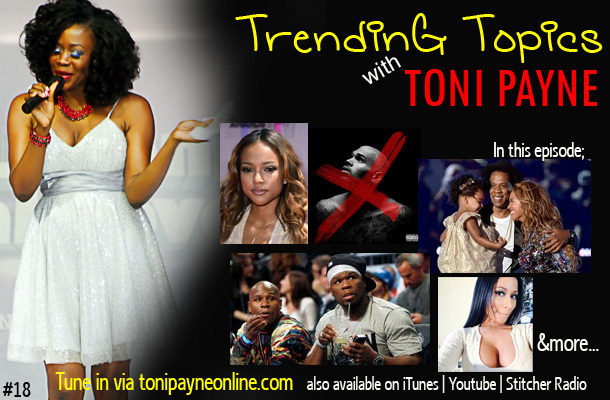 Trending Topics with Toni Payne Podcast talks; 50 cent vs Mayweather in the you can’t read beef, Blue Ivy in what’s hair gotta do with it, the Karruche story. I also discuss Finding Fela, 50 Shades of Grey, movies opening this week, songs that I am feeling, what songs to expect on Chris Browns X album and lots more. This is where I discuss all the hottest topics in pop culture, lifestyle, news and entertainment. I also give you all the latest updates on Music and Movies showing in theaters. Tune in and don’t forget to tell a friend. It is guaranteed to be an awesome episode. This episode is also available on iTunes, Stitcher Radio, and Youtube, Soundcloud, Hulkshare, etc. If you enjoyed this episode, kindly subscribe, share, rate and comment. 50 and Mayweather have some serious issues with each other, it’s insane. BLUE IVY IS A CHILD, please people, remember that. her hair’s fine.